Forest Garden 4 x 3 Overlap Dip Treated Apex Shed: This Forest Garden Overlap Shed is perfect for smaller gardens with its compact size and the traditional apex style roof design makes this shed look great standing alone. The Forest Garden Overlap Shed has been manufactured with 7mm square cut overlap construction which allows flexibility of the boards to contract and expand. The single door features double ‘Z’ bracing for added strength and security and can be hung on either side, depending on your personal preference. 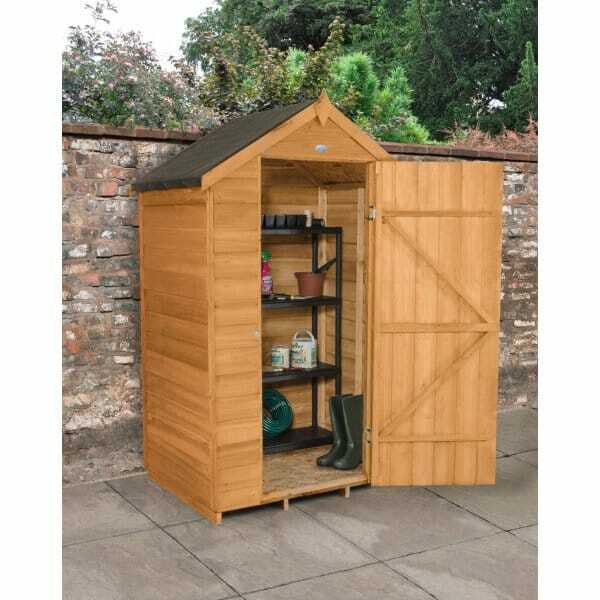 This Forest Garden Overlap Shed has no windows and features a secure hasp and staple lock which will add to the security of this shed in your garden. This shed has been made from FSC certified timber and has been given a dip treatment and comes with a 10 years manufacturers guarantee against rot when treated annually. The roof and floor boards are constructed from OSB and shed felt is included.